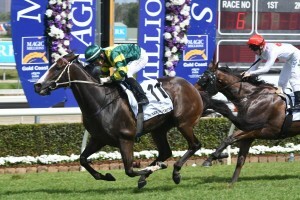 Trainer Matt Dunn is likely to map out a Stradbroke Handicap campaign for Care To Think after his new stable star stretched his winning run to five with victory in the $1m Magic Millions Cup (1400m) at the Gold Coast last Saturday. Care To Think, above, will be set for the Stradbroke Handicap after making it five wins on the trot in the Magic Millions Cup at the Gold Coast. Photo by Steve Hart. Care To Think was sent out as the $3.10 favourite for the Magic Millions Cup on the back his excellent form and gave the punters nothing to worry about, cruising to a one and a quarter lengths win over the Gai Waterhouse and Adrian Bott trained front runner Arbeitsam ($14). Dunn said that he would be happy for Care To Think to bypass the Sydney and Melbourne 2018 Autumn Carnivals and concentrate on the Brisbane Winter Carnival with the Group 1 $1.5m Stradbroke Handicap (1350m) at Doomben in June as his main goal. “I think he’s probably a Stradbroke horse, to be honest,” Dunn told The Courier-Mail. Care To Think jumped from the outside barrier in the sixteen horse field but leading jockey Jeff Lloyd was able to negate that early hurdle and crossed over easily in the early stages to settle the So You Think gelding in a beautiful trailing position behind the leading division, although he had to be content with a three wide position. A wide run didn’t affect Care To Think’s late finishing effort and the four year old strode to the front half way down the straight to record another stylish win. Care To Think began his winning run in a 1350m three year old Handicap at Doomben on July 22 before Dunn took him to Sydney to win a 1400m Highway Handicap at Randwick on August 5. Following a short break Care To Think began his Magic Millions campaign with a first up win in a 1200m Class 6 Plate at Doomben on December 16 followed by a win in the $150,000 Magic Millions The Buffering (1350m) at Doomben on December 30. Last Saturday’s Magic Millions Cup winning cheque of $600,000 took the four year old’s total prizemoney earnings to $842,725.